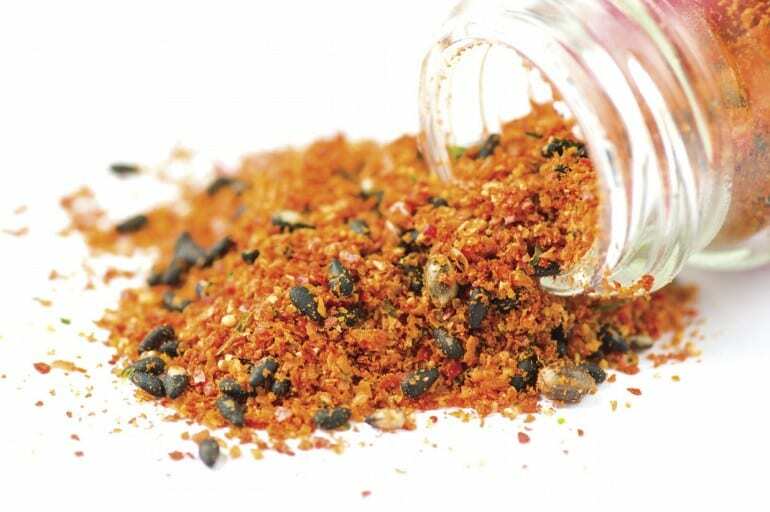 Other than wasabi, shichimi togarashi, a seven-flavour chilli spice mixture, is probably one of the most ubiquitous Japanese condiments. This is typically made from the following ingredients: coarsely ground red chilli pepper, ground sansho (Japanese pepper), roasted orange peel, black sesame seeds, white sesame seeds, hemp seeds, ground ginger, nori (seaweed) or aonori (green laver), though some recipes may substitute any one of these with poppy seeds, yuzu seeds, rapeseeds or shiso. It may look like a simple condiment, but its flavour is actually quite complex, due to the varieties of spice used in it. This mixture dates as far back as the 17th century, after red chilli peppers were first introduced into Japan from China as a type of herbal medicine. It was usually only available at herbal medicine shops. And while fresh chilli peppers are sometimes used, the dried forms are more common. Be sure not to confuse shichimi togarashi with ichimi togarashi; the latter is straight up chilli powder. Shichimi togarashi is usually found in more casual dining restaurants, izakayas, or soba and udon shops. It’s hard to find this condiment in higher-end restaurants that serve up dishes with more delicate flavours such as sushi or sashimi. As the mixture is made up of ground herbs and spices, shichimi togarashi does not usually have a long shelf life. If it’s fresh, the mix should have a bright colour. Stay away from it if the colour of the spices look like they have faded, or give off a strange smell; the sesame seeds are usually the first of the spices to turn rancid. Shichimi togarashi gives a nice kick and flavour hit to soba, udon or even a simple bowl of rice, but it can also be eaten with yakitori, tsukune (chicken meatballs), or grilled fish. Just a little of it goes a long way in giving those dishes a more complex flavour. A simple way to enjoy it is to sprinkle some of it into ground pork before grilling them into patties.